The Red Gate launching new tool “Source Control for Oracle tool” on March 12, 2013. Manual processes to script out database objects and check in them into SVN or TFS, can be time consuming and error prone. Source Control for Oracle automates scripting of objects and check-in to SVN or TFS. Developers and DBAs can see a history of objects that have been checked in to source control, when and by who. They’ll be able to see the check-in message and a side-by-side diff view of the creation script before and after check in, object by object. Pending check-ins are indicated on the taskbar icon and within the tool to prompt developers to keep source control up-to-date. If developers are working on private schemas or a dedicated instance they can see other team members’ changes to objects and apply these from source control to their schemas before working on them. If developers are working on a shared database they can see all the objects that haven’t yet been checked in to source control. And a history of the objects that already have been, when, and buy who. The side-by-side diff view (before checking in changes, updated a local instance, or when looking at the audit trail under History) means errors are easy to spot. 2. Using the comments section below, tell me your most painful experience which could have been easily avoided by using source control. It doesn’t have to be a lack of database source control, it just has to be a story where, things could’ve been easier if you had the right source control tools. On April 1st 2013 I’ll choose the best story and author will get a 5 user license of Source Control for Oracle. Please make sure you comment under an account which I can use to get in touch with you if you make the top story. Particularly painful stories will earn extra points as will stories where the pain was generously shared with a larger team! Application using JDBC 10.1.0.5 fails with below error after upgrading your database from Oracle 9i to 10g. JDBC Version 10.1.0.5 to 11.1.0.7 are affected with this issue. Cause:- The error is due to the published Bug 5851267. Solution: This issue has been fixed in 11.1.0.7.
you can use the following workaround to resolve the issue. Set database parameter "_optimizer_join_elimination_enabled" to false. By doing this you can disable the elimination transformation. Rduced latency - Data must remain up-to-date without latency. Heterogeneity and IT flexibility - Integration and replication across different IT systems. 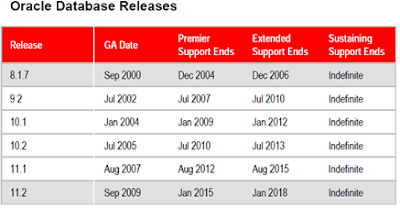 Oracle GoldenGate provides the solution for all these challenges. It is a high performance software application for real-time transactional change data capture, distribution, transformation and delivery across heterogeneous. Increased extensibility by taking defined actions based on an event record in the transaction log or in the Trail file. Oracle GoldenGate Monitor Agent - An Oracle GoldenGate Monitor Agent is installed on Oracle GoldenGate instance. It collects information of the instance and sends it to the Oracle GoldenGate Monitor Server. Oracle GoldenGate Monitor Server - The Oracle GoldenGate Monitor Server coordinates the monitoring of multiple Oracle GoldenGate instances..
Oracle GoldenGate Monitor Repository - The Oracle GoldenGate Monitor Server uses a database as a central repository to store information about users and groups, process status, monitoring points, events, and other information. The server Operating system is recently upgraded to newer version and suspected the issue might be related to library relink and ran “relink all”. The “relink all” failed with below errors. Solution: Finally figured out that the issue is related to missing 32bit RPM "glibc-devel (32 bit)" and after installing the RPM the database upgraded successfully to Oracle 10g R2 10.2.04. Oracle patch set install failed with error “libawt.so: libXp.so.6: cannot open shared object file"
We have received below error when we are applying 10.2.0.4 patch set (Oracle 10g R2) on REHL5. Exception java.lang.UnsatisfiedLinkError: /tmp/OraInstall2013-01-10_09-32-18AM/jre/1.4.2/lib/i386/libawt.so: libXp.so.6: cannot open shared object file: No such file or directory occurred.. Normally you will receive this error when 32bit libraries are missing. Before applying the patch make sure you have both 32bit and 64bit libraries are installed on the system as per Oracle recommendation. The 32bit RPM's should solve the problem. If you still see any issues then you might be missing other RPM's and refer Oracle Documentation. I have received below error on one of the 10gR2 database. If user or application running many jobs then the processes running the jobs may use an increasing amount of memory over time and the job queue process may fail with ORA-4030 errors. Work around: When running large numbers of jobs, restart the session occasionally. If user or application using UTL_FILE package then you see a constant growth of memory & the heapdumps suggest "koh-kghu sessi" heap is growing as a part of allocating chunks marked with "pmucalm coll", then you might be hitting the bug 7197637. The affected Oracle versions with this bug are 10.2.0.4 and 11.1.0.6 and it is fixed in 11gR2. Workaround: Do not open too many files. If your database running in <= 10.2.0.4.4 then you need to choose one of the below options. OERR: ORA 4030 "out of process memory when trying to allocate %s bytes (%s,%s)"
Please note that there are different errors across the various versions. I would recommend checking the Look-up Tool to find the Actual Cause and Possible solutions and contact Oracle Support.